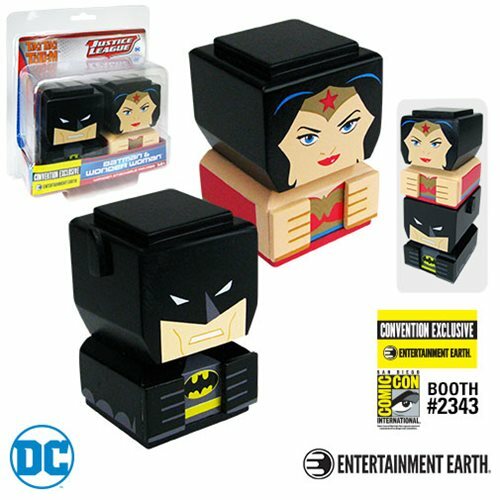 BATMAN™ and WONDER WOMAN™ unite as stackable wooden figures! The DARK KNIGHT™ and AMAZON PRINCESS™ each stand about 3-inches tall. Entertainment Earth Convention Exclusive! You've never seen BATMAN™ and WONDER WOMAN™ like this before! Welcome these DC superheroes to the world of stackable wooden Tiki Tki Totem pieces, and create your own custom Tiki Tiki Totem pole. Standing approximately 3-inches tall (subject to change), the DARK KNIGHT™ and AMAZON PRINCESS™ feature stunning 360-degree artwork so they look fantastic from every angle. The Batman and Wonder Woman Tiki Tiki Totem Set of 2 - Convention Exclusive is a limited edition that includes a holographic sticker with the production number, so the time to order yours is now! Ages 14 and up. BATMAN and WONDER WOMAN Team up in Convention Exclusive Tiki Tiki Totem!